Once in a blue moon, for those who can’t attend Friday’s regular meeting, FMEC organizes English practice meeting on weekend. The meeting program is different from regular meeting on Fridays, so please make sure the meeting agenda if you are thinking to join this event. What favorite staff you have bought recently? Topic 1, Can you really tell if a kid is lying? Do you think can we really reveal people's hidden emotion by looking at facial blood flow changes? If "transdermal optical imaging" is put to practical use, what will it bring positive/negative changes to our society? The speaker says that the accuracy of "transdermal optical imaging"　is about 85 percent. If you can use the technology to read politicians' emotions, marketing research, or even dating, how are you going to use it? Which item do you agree the best among 17 things? Which item do you want to focus on if you return to in your twenties? Does any of this advice apply to both men and women? Do you have any advice for people in their twenties? It was FMEC’s first trial to do something on weekend. 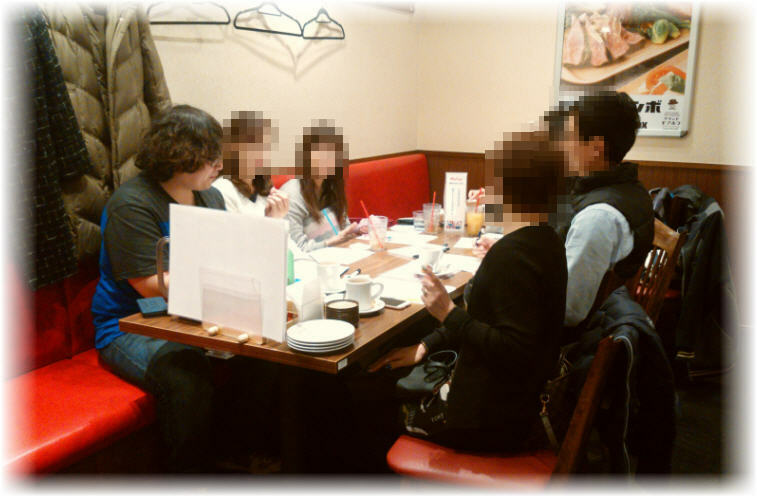 We have 6 people, very small group, but all members English level are very high, it was very useful event for Japanese English speakers. This Saturday, we will be having a small group (for a start) of people (Japanese) attend a casual 'class' about proper and perfect American English pronunciation. And we will invite an American guest to go though this event. Since this will be a test run for the availability and interest of participants, we will be limiting the number of people to 10. If the reservation is full but you are interested, just send a message to the organizers. For those who wish to participate, there will be a fee of ¥500 per person, not including food and drinks. You will be given handouts with exercises to improve you pronunciation. RSVP: From FMEC meeetup or FMEC application form.